It’s often helpful to have some animation showing when an audience files into the room, just to elicit some interest. When you’re ready, you can stop it and start the main part of your presentation. I’m going to tell you about one technique to accomplish this. This technique uses a looped presentation in which all the slides except your introductory animation are hidden. Because of this, you only see the introduction. Then you use a button to link to the slide that acts as the first slide of your main presentation. Even though that slide is hidden, PowerPoint displays it, as well as the rest of the hidden slides. 1. Create some slides with a welcoming message before your main presentation. 3. Select all the slides in the Slides pane (click the first, press and hold Shift, and click the last). In PowerPoint 2003, choose Slide Show> Slide Transition. In PowerPoint 2007, click the Animations tab. In PowerPoint 2010, click the Transitions tab. 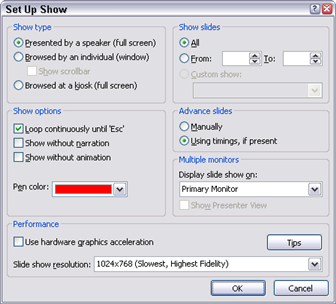 In 2003, in the Advance Slide section of the Slide Transition task pane, check Automatically After and enter a number of seconds. In PowerPoint 2007, do this on the Animations tab. In 2010, do this on the Transitions tab. I found that 3 seconds worked well for the above slides. Uncheck On Mouse Click. If you want, you can add a transition effect. In PowerPoint 2003, choose Slide Show> Set Up Show. In PowerPoint 2007 and 2010, click the Slide Show tab, and click the Set Up Slide Show button. In the Show Options section of the Set Up Show dialog box, check the Loop Continuously Until ‘Esc’ check box. The Advance Slides section should have the Use Timings, If Present option checked. This loops the entire presentation. Click OK.
To create a button to link to your main presentation, you can use any shape. In 2003, from the Drawing toolbar, choose AutoShapes and choose a shape. 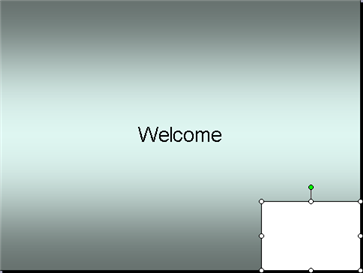 In PowerPoint 2007 and 2010, choose Shapes on the Insert tab and choose any shape. Then drag the shape on the first slide. With the button selected, choose Slide Show> Action Settings. In PowerPoint 2007 and 2010, choose Action on the Insert tab. In the Action Settings dialog box, choose the Hyperlink To option. From the drop-down list, choose Slide. (Be sure not to choose Next Slide, because that will bring you to the next slide in the looping introduction!) In the Hyperlink to Slide dialog box, navigate to the first slide of your main presentation (in this example, the 4th slide), and click OK twice. You want to be able to move to your main presentation at any slide of the intro, so copy the button to the Clipboard and paste it into the other two slides of your introduction. If you tried out your presentation now, clicking the hyperlinked shape wouldn’t loop the intro. Why? Because the rest of the slides (your main presentation) are probably set to advance On Mouse Click (which they should be). So the presentation advances to the first slide of your main presentation and just sits there, waiting for a click. To get the looping effect, you need to hide the rest of the slides. In 2003, in the Slides pane, select them and choose Slide Show> Hide Slide or right-click on the slides and choose Hide Slide. Make sure rest of slides are set up to advance On Mouse Click. To do so, with them all still selected, in 2003, choose Slide Show> Slide Transition. In the Advance Slide section, the On Mouse Click checkbox should be checked and the Automatically After check box should be empty. In PowerPoint 2007, click the Animations tab and look under Advance Slide. In PowerPoint 2010, click the Transitions tab for the same setting. Save again and try out your presentation. The first 3 slides will loop over and over because all the other slides are hidden. When you’re ready to start, click the lower-right corner of any of the slides in the introduction to move to the first slide of the main presentation. When you get to the last slide, you may click and realize that you’ve gone back to the first slide of the introduction! That’s because the slide is looped, but you don’t want that to happen. A looped slide doesn’t have a black warning slide at the end, so you should create one. Add a new slide at the end and make its background black. After the audience leaves, just press Esc to return to Normal view. I get to the first slide (which is slide 5) of my presentation but it goes back to slide two and repeats the loop again. I’ve checked all the hidden slides have “on mouse” checked. What am I missing? Is the problem that it doesn’t go back to slide 1? have the last few slides loop continuously, during the Q & A part of my talk? Try a link to another looping presentation. Good Article.. The looping and the click action works great! But when i advance to the main slides and i hit back button to go the previous slide, it goes to the introduction loop and keeps looping until i click to move forward to the main slide. (this doesn’t happen all the time, meaning- the back button would work a few times but then revert back to the loop).. any suggestions???? following up on my previous post— just found out the weirdest thing with it is that it reverts back to the loop exactly the fourth time i hit the back button-no matter which slide i am on… moving to the next slides works OK…. appreciate your input on this one. Thanks ! I’d have to see the presentation, but I wouldn’t recommend going back when the previous slide is a loop. Go into Normal view and see the order of the slides and that might help you figure out what is happening. Why do you want to go back? Thanks for these instructions. I thought I had followed them faithfully (PowerPoint 2007). I am only looping one slide, which works perfectly, but when I click on the hyperlink box the next slides are blank. Is this because I’ve hidden them? How do I get them to appear? Disregard previous message. I created a custom show and hyper-linked the looping page to that one on a mouse click. I couldn’t have done this without your help. Thank you so much. If a hyperlink goes to a hidden slide, it will appear. I can’t know what you’ve done, but check that you don’t have blank slides in the presentation. I’ve looped the first 5 slides in my presentation, and inserted a hyperlink at the bottom of the screen to go to slide 6. However, when I click on the link, it goes to slide 6, but then back to the looped slides, and not forward to the main presentation. Can you help? Also, is it possible to loop slides at the beginning and at the end of the show? I wanted some playing when people come in, and others playing when they go out. If so, how do I do the last bit? The presentation goes back to the first slide after the last. Do you have more than one slide in your main presentation? I just went through the steps and it works for me. Regarding a loop at the end, I’ll work on it and write a blog post. Hi Ellen, Yes, I do have more than one slide in the main presentation – I think there’s 10 or so others. There are 5 slides on the introductory loop. Does it make a difference that I’m using Powerpoint for Mac? Your instructions did seem to work up until the point I tried to continue with the main presentation, at which point, the first slide comes up but then when I try to move it on to the next slide, it goes back to the looped slide when I click the mouse. Thanks for your help. Helen. Thanks for your blog. I have set up an into slide (just one slide) to loop at the beginning of my presentation, and have hidden the ramaining slides so it will only loop slide one. The problem is.. the slide will loop one time and then stop. I have it set up to auto advance after 3 secs and hidden slides are set to mouse click. Can’t figure out why my slide will only loop once and then stop. Hard to know what the problem might be, but I’ve never tried to loop one slide. Try duplicating that one slide, so that there are 2 slides looping. Since they’re the same, the audience won’t know. Thank you so much step by step instructions were very clear, my powerpoint loop looks great!! I, like Helen, am having the issue of my main presentation not progressing past its first slide, it goes back to the looping intro. Unlike Helen, I am using a PC. Did you see the 1st 3 slides loop over and over? Did you hide all the slides in the main part of the presentation? why it’s not working to my power point it’s not continuously play . .but i follow the instruction i click the slide show set up and i put check in loop . .it’s still need click one by one to show other slides . . I am having the same issues as Artee. I create slides for a worship service and have announcements running on loop. They all link to the fist slide of the worship service. Occasionally we need to move backward because pastor decides to sing a verse of a song again. Would be really helpful if it didn’t kick back to the loop when moving backwards. I can find no differences between slide animations and advance on mouse click is set for all service slides. Thanks for you help. Other than this one issue, this works wonderfully. I’d have to see the presentation. I could do some consulting, if you need it. Go to my Estore link and look at the 1-on-1 consulting. I set my presentation to loop continuously through the first slide only before it goes to the rest of the slides. That one slide has several photos that fade in and out. After the last photo, it loops back to the beginning and starts all over again. Unfortunately, it only loops through that slide twice and then stops. Any ideas as to what I’m doing wrong? I think that some of you are coming up against the problem I describe here: http://www.ellenfinkelstein.com/pptblog/create-hyperlinks-in-a-timed-presentation/. If you add animation to the intro, it may not work the second time around. For the situation of several photos fading in and out (sounds pretty! ), I’d suggest putting each photo on a separate slide and using a Fade transition (at least in PowerPoint 2007 or 2010, where the transitions look better). Let me know if this helps. Thanks Ellen. I thought of the same idea of putting each picture on a different slide and I’m sure that will work. What I ended up doing was repeating the first slide (making it both slides 1 and 2) and then looped through the two slides. It worked perfectly. The only reason I didn’t put them on different slides was that I already had them on one slide and I was lazy. You tips have been great. Thanks. Hi Ellen. In reading some of the previous posts, I noticed several people complained about getting to the first slide of their main presentation and then having it jump back into the loop the first time they click to go to the next slide. I figured out what the problem is because I suffered from the same issue. When youare setting up the slide show program and you go to the “Set Up Slide Show” button, the upper right hand corner has a section entitled “Show Slides” and gives you to choices “All” and “From-To”. If you use the “From-To” choice and only list the slides in the loop, you will continually be sent back to the loop every time you click. You need to choose “All”, making sure the non-loop slides are hidden. Hope this helps. Hi, thanks for this blog, it works fine. Please let me know how I can add music to the 3 slide intro. My problem is that the intro stops after the third slide when I insert a song. I haven’t tried using music inside an introduction. This is great — just what I needed. The hide-slides part was the hidden secret to success! Many thanks! One thing I did differently was to simply use “no fill” for the hyperlinked rectangle. It worked fine and eliminated the need to deal with transparency settings. Yep, I have the same issue. The loop works fine (4 slides) and I can advance to slide 5 using the hyperlink in the hidden shape but then when I click on slide 5 to move it on to slide 6 it goes back to slide 1. AAARGH. Thanks Dave. You’re a star. That fixed it perfectly. Now I have to find a wig to replace all the hair I’ve just torn out!! This used to be so simple .. why did it have to get so complicated?? Thanks for bringing this out. “All” is the default, so most people wouldn’t have that problem, but obviously, some people do. Many thanks for the detailed explanations. Do you know if it is possible to have a slide show that starts with a slide 1 then advances to slide 2 when clicked, then has a loop of slide 3, 4 and 5 which then advances to slide 6 when clicked? What I am really trying to do is repeat an animation on one slide but this doesn’t seem possible so I was wondering if the loop within a hidden slide show would be a work around. We are having a similar problem to Heather. We have a PowerPoint starting at slide 1 then going into the custom slideshow starting at slide 2 which then loops between slide 2 and 3. We have placed an invisible button on both slides to advance to slide 4 at any point when the presenter is ready to start. The problem is once we go to slide 4 it doesn’t continue the presentation and go onto slide 5 instead loops back to the custom show. We also have text (3 testimonials) that are animated on slide 3. Hi Ellen, this was great. I followed the instructions exactly, I am using ppt 2010, but when i went into slide show presentation and tried to click on the invisible box, I got nothing, no hyperlink, but I see the hyperlink is set up. I have to right click and then i can “go to slide __”. Any suggestions why the hyperlink would not be working? thanks. Laurie, I don’t know. To troubleshoot, try a new presentation, create 2 slides and try to create a hyperlink that isn’t transparent from the 2nd slide to the 1st slide. Does it work? Try to create a hyperlink to a website. When you say that the hyperlink is set up, do you mean that you see the hand cursor when you hover over the hyperlinked object? I have done all settings. I can loop my first slide which is the intro of my presentation. The problem is it loops only 2 times after which it displays the same slide permanently. If i click on the shape we have dragged earlier, then it will proceed with the presentation itself. What could have went wrong with my settings that it loops only two times? Thank you very much. How can I add music that plays continuously through the loop. When I add music it want to restart when the presentation repeats itself. I give talks on my book, so I created a looping slideshow as per your directions to show as the attendees arrive. I also inserted ongoing music being played from a CD on to this slideshow. When I’m ready to start my talk, I click over to my main slideshow with no problem. However, I can’t get the music to stop. I inserted 999 slides so that the music will keep looping since I never know how long I’ll be playing this slideshow before switching over to the next. Can you give any suggestions? Thank you to Dave for solving the problem many of us were having! That solution worked perfectly. Anyone who is having the problem of getting past their loop to the first slide in their main presentation, and then they’re unable to advance to the second slide in their presentation, should solve the problem by going into Set Up Show and checking off “All,” rather than the slide numbers in the loop. I have another question: is it possible to play a playlist of multiple songs during the looping introduction, not just one song? Currently we play our playlist from an ipod while the introduction is on while the audience is entering the room and getting seated. But it would be wonderful to have it all embedded in powerpoint, so there’s one less piece of technology to start and stop. I don’t know of a way to create a playlist, but you can combine songs into one file (perhaps using Audacity) and loop the sound in PowerPoint. Hi – I have an animation sequence on one slide (2 pictures – fade in and out – 4 animations in total). And I can make it loop. But my background is a video and with the video in the background – it doesnt want to loop – if you have any suggestions on how to get around this, I would be very happy. I have a presentation on a continuous loop. I would like to have music playing during the loop. Every time I add music I add to the first slide, select start automatically and loop. But when I play the slide show it will no longer transition beyond slide 1. How do I get the slides to transition as before with the music? To achieve success in a corporate world we need to have strong presentation skills. The way you present yourself plays an important role in deciding your success or failure. It can be both your friend and enemy depending upon how well you manage or use it. I was having the same problem as a few others- with trying to go back a few slides mid presentation and having it take me to my intro loop instead. I was able to fix it by using the custom slide show option. I made my intro slides ‘custom show 1’ and my main presentation ‘custom show 2’. Then for my hyperlink on my intro slides I had it link to ‘custom show 2’ with the Show and Return box checked. Everything else was the same as how you suggested. Just a note to everyone (and Ellen)… the comment from Dave on July 10, 2012 at 9:59 am was correct. The looped slides need to be set to “ALL” or when you exit the loop, any attempt to advance to the next slide will be met with a return to the loop. Thanks, Ellen! It works like a charm! Glad to help! I invite you to subscribe to my PowerPoint Tips Newsletter so you get all of the tips I write. You can do that at http://www.ellenfinkelstein.com/ppt_submit.html. Thank you so much. I’ve been wanting to do this for years! It’s a complicated work-around, but it works! I would like a link an excel file with powerpoint. I am able to create the link. But it works only on slideshow mode. Is there a way to click the link on normal mode, i.e., without going for slideshow? This was so helpful – thank you! I built my presentation using PowerPoint 2011 for Mac according to your instructions, and I got it to play perfectly just as you described. (1st three slides loop, then the user clicks an invisible box to skip to the fourth.) But when I gave it to one of our company executives to play in PowerPoint 2007 for Windows, it did not work. It stayed in the loop, and clicking on the invisible button did nothing. I tested it on another PC and confirmed the same thing. Chuck, I don’t know why that would happen. I’d try 1) trying it on another Mac and 2) creating it from scratch on a PC and seeing if it will work. If you don’t have a solution after that, let me know and I’ll ask some people who work on both Mac and PC. How do you make a slide go back to the first slide like in an information kiosk when someone doesn’t touch the show for lets say 5 minutes. I’ve arrived at a good solution for looping music with looping introductory slides. I timed 3 slides to coincide with the length of the audio file. However, I found that with the remaining slides hidden, I could not get an audio file on one of those hidden slides to stop after 2 slides. I’ve settled for no animation, so that it stops after 1 slide. Nothing I’ve tried so far enables a hidden slide’s audio to stop after 2 slides. I don’t know if it will help but if you use the from-to option and loop, you can create a custom slide show and if you link to the custom slide show in the “place in this presentation”, the custom slide show will loop until you press escape. 2. slide change allow only after mouse click but after 30 second pause. 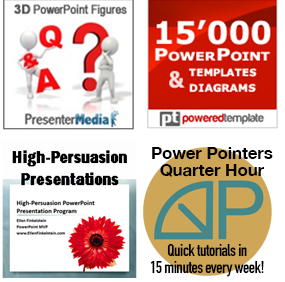 PowerPoint Tips Blog <Loved it! This was very helpful! I used it to loop and entire presentation with a different video on each slide. This way multiple videos without actually having to splice them together. I just set my Slide advance time to the length of the longest video, then set all the the videos to start automatically. Really a great work-around. Thanks for posting! My looping presentation works fine at home BUT when I save it to a flash drive and load it onto the church’s computer, it no longer loops. 🙁 Is there anyway to fix this? Best Instructions I found online – It finally made sense and I achieved what I needed to do. THANK YOU!! I have animated text on top of a video on the first slide. I would like this to loop continuously, but instead the animations only play the first time and video continues to loop without any text visible. How do I get the video and the animation to loop together in the first slide. I want to move to the rest of the presentation when I’m ready by clicking once. I’ve never tried to put both techniques together, though. Dear Allen I am using 2016 PowerPoint and want to Transition repetition in same slide for example: Slide One and using Transition Blinds and wants to this (Blinds)transition repeat until next slide open. Please help me out how I can do this with full details. Waiting for your early reply. I’m not sure I understand. You want the transition to repeat several times before the next slide? I can’t think of any way to do that except by trying to recreate the transition effect with animation. Great instructions! it worked well. looking forward to more awesome tips. thanks a lot Ellen. you are a blessing! Dave, thank you so much! That was my problem and I was getting so frustrated! Hi Ellen, I have saved a ppt presentation as a macro-enabled show, but at the end it goes into a loop and starts again. How do I stop the loop? Is it set to loop in the Set Up Show dialog box? (Go to Slide Show, Set Up Slide Show to check. This worked great. I am using 2010. The only change I made was to select all the hidden slides and take them off automatically advance – used manual click as I had a number of animations I wanted to control. Thanks! Ellen, your looping technique works great. I use a fade transition between slides so it doesn’t make a stark jump. Visually, it looks just the way I want it to. I added a music mp3 to play across all the slides and that works pretty well. Unfortunately, the music doesn’t start playing until the first slide finishes fading in. Is that normal or is there a way to get the music to start playing as the first slide is fading in? Thanks for your help.